Curious about the future of Destiny? Here's a leak you might find interesting—a graphic purporting to lay out what developer Bungie's got planned for the rest of 2015 and beyond. The image, which has apparently been floating around the internet since October but only drew widespread attention this morning thanks to a massive Reddit thread, shows the already-announced first two DLC packs (The Dark Below and House of Wolves) followed by a larger "expansion" called Comet that's slated for September of this year. After that is something illegible ("Vex" something?) and then something called "Forge of Gods." So is it real? One source familiar with Destiny's development told me he believes so—and that there have always been plans to release an expansion next fall with the name Comet—but many of the details may have changed. So the overall gameplan—House of Wolves in March; the bigger Comet this September; two DLC packs after that—could remain the same, but the exact contents of each update are probably still up in the air. House of Wolves: three new story missions; one strike; one raid; new PvP maps; the addition of the Reef (where you visit the Queen in the main game). Comet: 12 new story missions; three strikes; one raid; one patrol; one public event; three new sub-classes; and the increase of "Base Level" to 30, which will presumably change the Light system quite a bit. Also, a new map called Hive Ship. 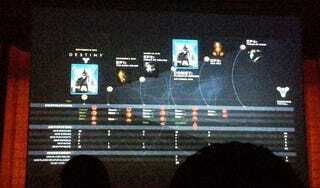 The third DLC pack will also add story missions and strikes; the fourth is all blank on that image. This all makes sense, of course—and the roadmap fits perfectly both with what I've heard from industry sources and from what we've seen in other Destiny DLC leaks. It's possible the exact numbers will change as Bungie keeps working on this stuff, but it looks like now we've got a full idea of just what's coming this year, not counting free updates and other patches.